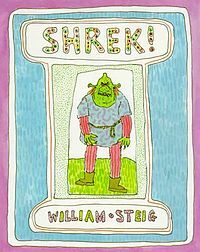 Most people are familiar with at least one character from the works of William Steig (1907-2003): Shrek, that sweet but lonely ogre who leaves his cave to find his place in the world, which ends up being back at his cave, but no longer alone. 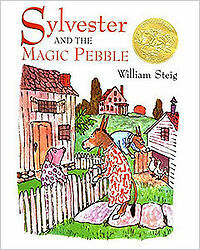 Steig has won a Caldecott (Sylvester and the Magic Pebble), two Newbury Honors (Abel’s Island and Doctor De Soto) and was nominated twice for the Hans Christian Andersen Award (first as an illustrator and then as an author). This book pulled me into the rest of my Steig collection, about six books that I can get through in a day. But I took time to savor Abel’s fortitude and cleverness when disaster strikes as he’s trying to retrieve his wife’s scarf during a storm. He spends a year stranded on an island, learning how to shelter, feed and protect himself, and trying again and again to get off the island and back to his wife. 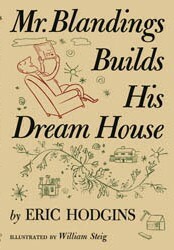 Steig started his career as a cartoonist for The New Yorker, swiftly moving on to illustrate books like Mr. Blandings Builds His Dream House (Eric Hodgins, 1946) and The Decline and Fall of Practically Everybody (Will Cuppy, 1950). It wasn’t until the late 1960s that he began writing for children, almost immediately winning the Caldecott with his third book for young readers, about a donkey who finds a magic pebble and turns himself into a rock without a plan for turning himself back into a donkey. For a fabulous bio and retrospective on Steig’s artistry, you can’t do better than this obituary for The Comics Reporter. 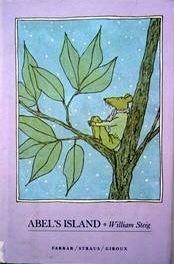 And if you want books full of charm and characters figuring out how to get the better of circumstances (not just loneliness or shipwreck, but also hungry foxes), Steig will satisfy your every desire. *See the bee! The bee is a busy bee. Oh, yes indeed! Ham and eggs is healthy for you. The wine is excellent. I am in the elevator. This entry was posted in Fantasy, Humorous, Newbery Award, YA Lit and tagged William Steig. Bookmark the permalink.